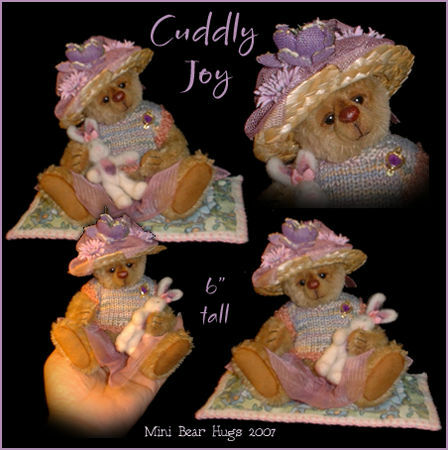 "Cuddly Joy" is an elegant & beautiful little girl with sleepy eyes, she's 6" tall , made of lovely mohair fabric and matching ultraseude, she has black glass eyes with upper & lower eyelids, she's 5 way jointed with cotter pin/disc ,armatures (in her arms),has waxed brown embroid nose and stuffed with fiber fill and tiny steal shots . She comes wearing a lovely multi coloured hand knitted sweater & accessoried with a beautiful crystal brooch & see through skirt.. Her hat is accessorized with ribbons and flowers ..
She comes cuddling her favorite white bunny (toy) which needle felted by me.. She also comes with her favorite blanket which she likes to sit on it..